Grounded: The Adventures of Rapunzel – Now available on Audio! 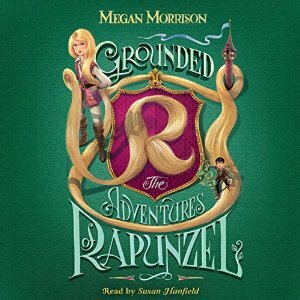 GROUNDED: The Adventures of Rapunzel written by the incredibly talented Megan Morrison – is now available on audio! I so enjoyed narrating this wonderful book for Scholastic Audio. I have always loved the story of Rapunzel and in Grounded: The Adventures of Rapunzel, Megan Morrison expertly creates a fresh, heartfelt spin to this beloved fairy tale. Following Rapunzel as she embarked on her many exciting adventures in the magical land of Tyme was such a treat and so much fun to work on! I especially loved how Megan’s characters grew and changed as the book progressed. To have a listen, please just click on the link below. Now available at Audible and Amazon.com! This entry was posted in Audio Books, Narration, News, Press, Voice and tagged Rapunzel; Grounded: The Adventures of Rapunzel; Megan Morrison; Scholastic; Fairy Tale; Jack and the Beanstalk; Susan Hanfield; Audiobook. Bookmark the permalink. ← Who Was Harriet Beecher Stowe? Now available on Audio!